Wash and trim Brussels sprouts. With tip of knife, cut an X in base of each. 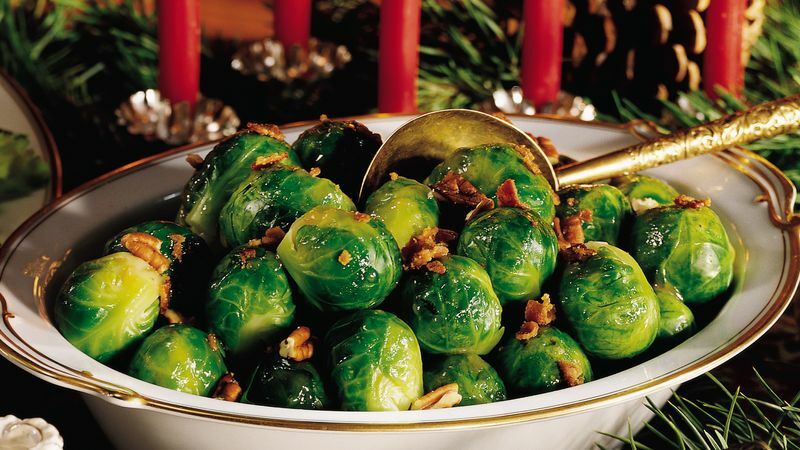 Place Brussels sprouts in large saucepan; add just enough water to cover. Add salt. Bring to a boil over high heat. Reduce heat; simmer 8 to 10 minutes or until tender. Meanwhile, cook bacon until crisp in medium skillet. Remove bacon from skillet. Reserve 2 tablespoons bacon drippings in skillet; cool. Add flour to cooled drippings; cook and stir over medium-low heat until bubbly. Remove from heat. In small bowl, combine brown sugar, water, vinegar and mustard; mix well. Gradually stir into bacon drippings mixture. Drain Brussels sprouts; place in serving bowl. Add hot bacon dressing mixture; toss gently. Crumble bacon over Brussels sprouts. Sprinkle with pecans. If desired, add salt to taste.